Due to the continuing deterioration of the structures supporting the sidewalks on either side of the bridge, Borough Council approved the closure of the bridge to vehicles so that pedestrians can continue to have a safe way to cross over the train tracks. A follow up inspection by the Borough Engineer on March 7, concurred with the decision to close the sidewalks pending a thorough hands on inspection to be performed by PennDOT in April. We will evaluate those results and make any changes to the status of the bridge pending considerations of public safety, cost, and feasibility of a number of different solutions. We take our responsibility for the safety or people crossing the bridge and the rail passengers below very seriously. The Narberth Avenue bridge will be replaced with a new bridge, scheduled for construction in 2020. Please stay tuned to www.narberthpa.gov and join our email list to stay informed. You don’t need to be an architect or design professional to appreciate buildings- their beauty, scale, materials, and what it feels like to be inside or walk past one of the many landmarks we have in Narberth. Take a look at this handsome drawing of the front elevation of the Narberth Theater and its easy to tell how much care and thought goes into designing buildings. Dated April 6, 1927 these plans were approved and the building is now more than 90 years old, adapting to new uses and creating a recognizable landmark that spans generations. Due to a pending leave of absence, the Borough is looking to fill the position of Administrative Assistant on a temporary, full-time basis. We anticipate the duration of the engagement to range between 12 and 24 weeks. The person in this position will be responsible for a variety of administrative functions in compliance with State and local codes, and ensures that these services and programs are provided efficiently and effectively. He or she will mentor under the direction of the Office Manager for a short period of time before taking over the duties of that position. If you or someone you know is interested in a short term engagement and would like to learn about local government administration, please forward our information and job ad under the employment opportunities page of our website. Narberth Borough has the following opportunities. If you are a resident of the Borough and are interested in any one of the following volunteer positions, please send us an email indicating your desire to serve and any applicable experience you have. Please email your information to appointments@narberthpa.gov by 3pm Friday, August 10th, 2018. Council will make appointments at its business meeting on Wednesday August 15th, 2018. If you have any questions please contact Michelle Carroll at mcarroll@narberthpa.gov 610.664.2840 ext 102. The three-member Civil Service Commission creates rules and procedures and acts upon the same for the recruitment of and disciplinary actions regarding police officers employed by the Borough. The Recreation Board serves as an advisory body to Borough Council on issues related to parks and recreation and will refer their conclusions, recommendations and opinions to Borough Council for appropriate action. 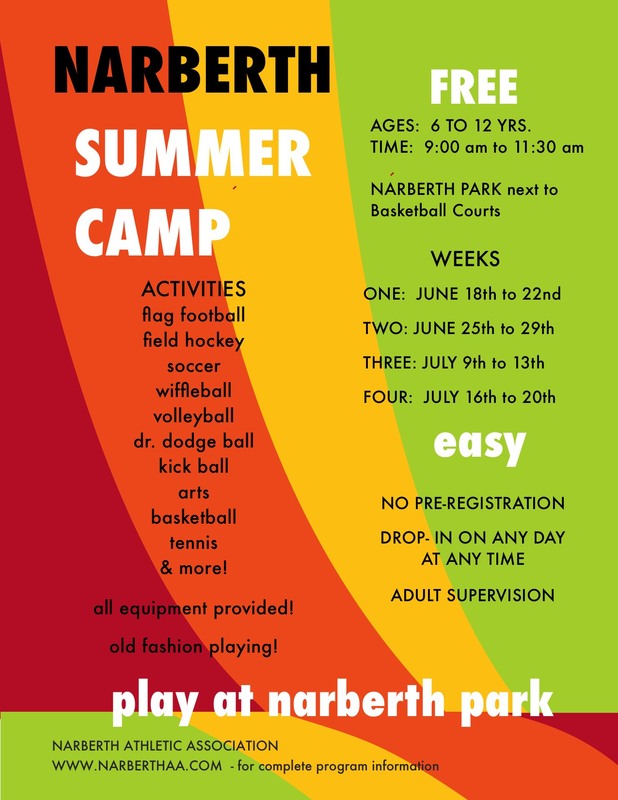 Summer Camp in Narberth Park! The bridge carrying Wynnewood Road (Route 3044) over the East Branch of Indian Creek in Narberth Borough and Lower Merion Township, Montgomery County, is scheduled to close for construction on June 11 as part of the Pennsylvania Department of Transportation’s (PennDOT) Rapid Bridge Replacement Project. The project should be complete by the end of 2018. During the bridge closure, drivers will be directed to follow a detour along U.S. 30 (Lancaster Avenue) and U.S. 1 (City Avenue). 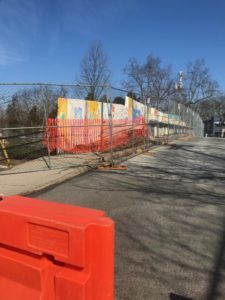 Residents on Woodside Avenue in Narberth Borough will be detoured around the bridge along Maple Avenue and Chestnut Avenue. Residents of Parkview Drive in Lower Merion will follow a detour along Clover Hill Road and Williams Road. The Wynnewood Road bridge averages over 9,300 daily vehicles. Built in 1934, the single-span concrete, solid slab bridge will be replaced with a new single-span culvert. Replacement work will be performed by Allan Myers of Worcester, PA. This bridge is referred to as JV-218 and is one out of the 558 bridges being replaced under the Rapid Bridge Replacement Project. JV references the joint-venture partnership between Walsh/Granite, which is leading construction for the entire project. To see the bridges included in the statewide initiative and to learn more about the Rapid Bridge Replacement Project, visit www.parapidbridges.com. Additional information on P3 programs in Pennsylvania can be found at www.p3forpa.pa.gov or by calling the project hotline at 877-444-9990 or email info@parapidbridges.com. Narberth Borough is hiring for a new position in the Department of Public Works- Director of Public Works. The Director of Public Works is an executive, supervisory and administrative position responsible for all Public Works personnel, programs and services. The Public Works Department focuses on maintenance and planning of public infrastructure including parks and landscapes, streets and signage, public spaces, trash and recycling facilities, stormwater systems, and sanitary sewer systems. For more information visit our Employment Opportunities page. Narberth Borough is in the process of drafting its first comprehensive plan and we need your input! The plan will outline the community’s goals and priorities and provide steps for implementation that will serve as a framework for the management of Narberth’s future development over the next twenty years. Your input as residents, stakeholders and business owners is critical in shaping the vision of how Narberth will look and function in the future. 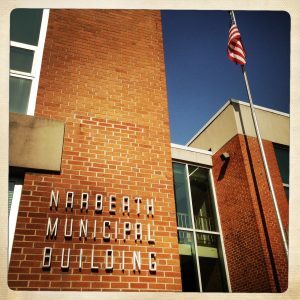 By sharing what you love about Narberth, and what you want to improve, you will help create a plan that reflects what is important to the community. Under the direction of the Borough Manager, the Office Manager is responsible for a variety of administrative functions in compliance with State and local codes, and ensures that these services and programs are provided efficiently and effectively. The Officer Manager is an important member of a small management team. The person in this position will demonstrate a high level of personal integrity and ethical behavior with a proven record of technical competence and a commitment to life-long career development and learning. This person will understand the positive value of developing and maintaining effective relationships with staff, elected officials, and the public. He or she will be well-versed in applying technology to further organizational efficiencies and demonstrate high attention to detail. The Office Manager will support the mission, philosophy, policies and procedures of the Borough. He or she will model integrity, curiosity, responsibility, creativity and respect for all persons and appreciate racial, cultural, and gender diversity. The person in this position will gain valuable experience in all phases of public administration in municipal government. The ideal candidate’s responsibilities will expand beyond the essential functions of the position as his or her fluency increases. Go to Employment Opportunities for more information. Due to the recent resignation of a member of Council, the remaining members will take action to fill the seat for the term expiring December 31, 2019 at their business meeting on Wednesday February 7th. If you are interested in being considered, please send a letter of interest and qualification to appointments@narberthpa.gov prior to the end of business Wednesday January 31st.